What do you want from your Western chinks? After all, this is about your needs, not ours. If you want leathers that are substantial, without going overboard, here's your site! Saddle Barn, Inc. uses quality chap leathers from the world's foremost leather tanneries. 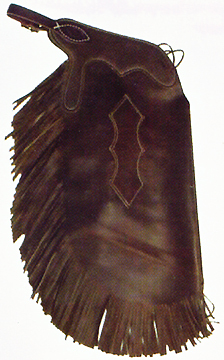 Their adult Western chinks are manufactured from top grain leather in the shorter, below-the-knee length of cowboy chinks, making a very functional design for working cowboys. Because Cultured Cowboy is an international supplier of cowboy chinks, we see that the Western work chink is gaining popularity for pleasure, or trail riding, as well as for working cattle ranches, especially when paired up with Olathe or Old West knee-high buckaroo boots. Chinks are also useful as a more decorative farrier, or hay apron. The waist is adjustable by front and rear fastening to make a comfortable fit easy. Styles with front strings, and front belts are here for you. String ties and conchos are both offered on your thigh patches. Easy replacement of thigh straps can be done locally when they finally wear out. Give us your waist, just below your belt, and your largest thigh measurement so we can assure they fit properly. Thanks! Work chap colors are usually dark brown, a medium tan, redwood, or Almond. 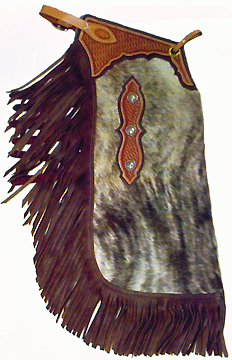 Bone, black, and hair on hides, as well as rended, (or split bodies), are also available. Other custom colors may be available for you. just ask and we'll see. 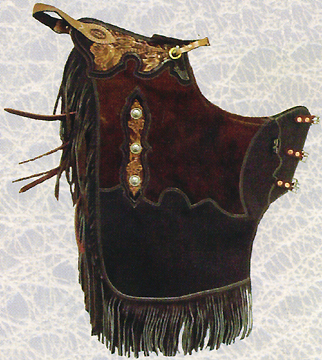 When ordering these cowboy chinks, or work chaps, each style is pretty much available in each color, and in the sizes listed, and in special sizing if needed. Inseam measurements are not applicable to chinks, and Saddle barn works more with outseam lengths than inseams on their work chaps. How about this! Cowboy chaps actually made in the USA! Top Grain Leather - assorted lighter brown colors. 3 to 4 oz. chap leather. Cut in fringe. Adjustable thigh straps. 29 inch outseam. Adjustable waist. Front and rear belts. Top Grain Leather Floral tooled belt. Medium Brown body. 3 to 4 oz. chap leather. Adjustable leg straps. Silver Conchos on leather Conchos on Diamond Thigh Patch. Stitched Fringe. 31 inch outseam. Adjustable Waist. Front and Rear Belts. Top Grain Leather Border tooled belt. Dark Brown body. 3 to 4 oz. chap leather. Adjustable leg straps. 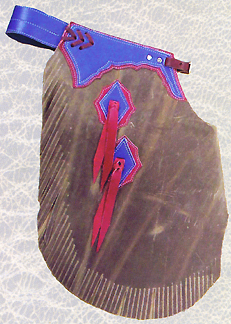 Silver Conchos on leather Diamonds on Fancy Thigh Patch. Cut in Fringe. 31 inch outseam. Adjustable Waist. Front and Rear Belts. Top Grain Leather tooled belt. Redwood body. 3 to 4 oz. chap leather. Adjustable leg straps. Silver Conchos on leather Diamonds on Diamond Thigh Patch. Cut in Fringe. 31 inch outseam. Adjustable Waist. Front and Rear Belts. Top Grain Leather Basket tooled belt & Thigh patch. Hair on Cowhide chap leather body. Adjustable leg straps. Silver Conchos on Basket Tooled Thigh Patch. Stitched Fringe. 31 inch outseam. Adjustable Waist. Front and Rear Belts. 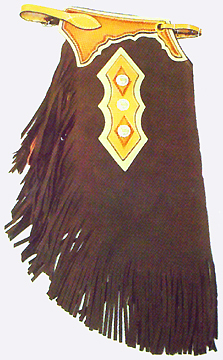 Shown Brendle with Dark Brown fringe. Top Grain Leather Floral tooled belt & Thigh patch. Rended Hair on Cowhide / Chap leather body. Adjustable leg straps. Conchos on Floral Tooled Thigh Patch. Stitched Fringe. 31 inch outseam. Adjustable Waist. Front and Rear Belts. Shown Dark Brown Body & Fringe / Brown Hair. Top Grain Leather Floral tooled belt & Thigh patch. Rended Hair on Cowhide / Chap leather body. Adjustable leg straps. 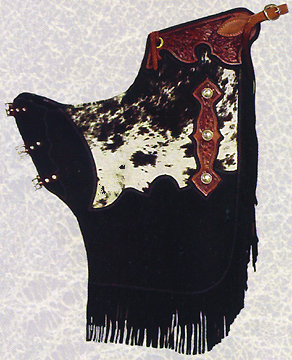 Conchos on Floral Tooled Thigh Patch. Stitched Fringe. 31 inch outseam. Adjustable Waist. Front and Rear Belts. Shown Black Body & Fringe / Black & White Hair. Top Grain Leather - assorted brown colors. 3 to 4 oz. chap leather. Cut in fringe. Two Adjustable thigh straps. (Adult chinks have tree) 28 inch outseam. Adjustable waist. Front string and rear belt. Kids Chinks are available in assorted colors, and in a few popular color combos. Prices start at Only $44.99. Email or call us. Assorted colors of leather. Top Grain. Assorted chink bodies and trims. Cut in fringe. Adjustable leg straps. 18 inch outseam. Shown left. For functional protection, choose from Cultured Cowboy's selection of specialized top grain or suede work chaps and hay aprons. 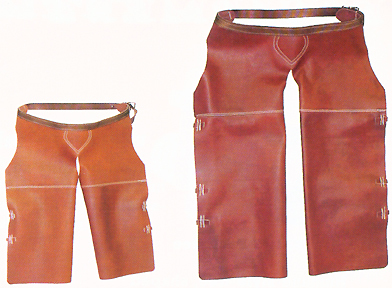 These using chaps and leather aprons will provide years of good service. 22 inch Outseam. 28 inch Outseam. Top Grain 3 to 4 oz. leather. Fully adjustable straps. 1inch nylon belt. Border tooled leather yoke. Top Grain 4 to 5 oz. chap leather. Buckled front belt and solid rear belt. 5 inch fringe with bottom cuff. Bone shown. 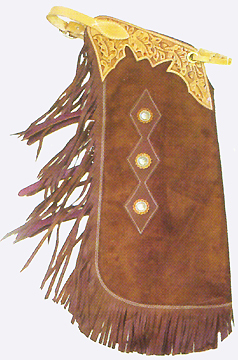 (body available in Bone or Buckskin) Inside pocket on left leg. Sized: Small, Medium, Large, XL. Border tooled leather yoke. Top Grain 4 to 5 oz. chap leather. Buckled front belt and solid rear belt. 5 inch fringe with bottom cuff. 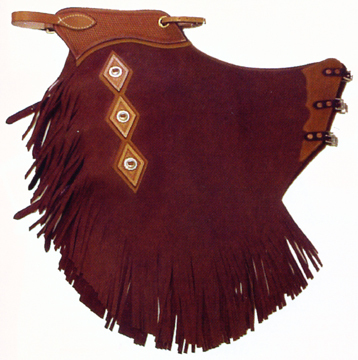 Buckskin shown. (body available in Bone or Buckskin) Inside pocket on left leg. and we will make sure these work chaps fit. Both the Shotgun and chink come with adjustable lacing (shown left), for up to 2 inches of extra sizing. Pockets are a customizing option on top hand chaps. Top Grain 3 to 4 oz. chap leather. Single pocket. 1 inch buckle back belt and string tie front adjustments. Small: 33" Outseam, 18" Thigh. Medium: 35" Outseam, 19" Thigh. Large: 37" Outseam, 20" Thigh. Assorted earthtone colors. Adjustable waist. 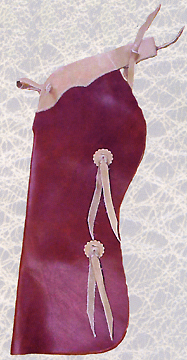 Two leg straps. The working chaps and work aprons below are One Size fits Most. 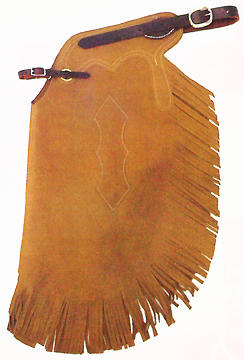 These suede chaps are actually by Supreme Western Products. To assist you in measuring properly, visit our Custom Chap Measurement page.